Blizzard has removed its battle.net branding from its game client, which is now simply Blizzard App. Last year, Blizzard announced that it would be killing the Battle.net branding for its gaming service. Today, an update for the Battle.net client has executed the initiative, removing all mention of the service. 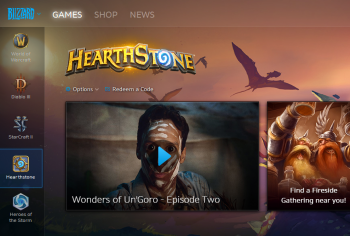 You'll notice that the Battle.net logo has been replaced with the Blizzard logo, and the application has simply been renamed to "Blizzard App". "Over time, though, we've seen that there's been occasional confusion and inefficiencies related to having two separate identities under which everything falls - Blizzard and Battle.net," wrote Blizzard of the transition. Blizzard says that the transition is purely a superficial one: everything will work exactly the same way and use the same servers as it did when it was Battle.net. The Battle.net URL also still works (for the time being). Battle.net launched more than 20 years ago alongside the release of the original Diablo, and pioneered the way PC gamers play video games online.